This recipe would be simply amazing to make for someone special for Valentines day! 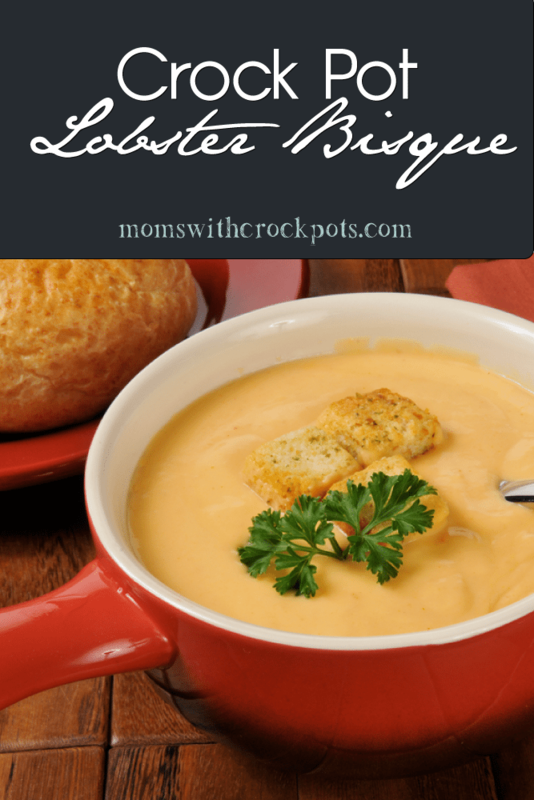 Try this simple and amazing Crock Pot Lobster Bisque Recipe. I love to make it for a special date night. That way I can have this cooking in the crock pot while I am busy during the day. While the ingredients aren’t exactly frugal, it is so worth it for this rich and decadent soup. In a small skillet saute minced shallots and garlic just until the shallots are wilted and starting to turn translucent. Add shallot and garlic mixture to a 4-quart or larger crock-pot along with tomatoes, chicken broth, old bay seasoning, dill, parsley, pepper & paprika to the crock-pot. With a very sharp knife cut off the fan part of the very end of the lobsters and add those to the crock-pot. Save the Meaty part of the tail for later. Stir, cover and cook on low for 6 hours or 3 hours on high. Open the crock pot and remove the lobster tail ends and discard. Using a blender or immersion blender puree the soup mixture to your desired chunkiness. You may have to do this in batches depending on the size of your blender. Add the soup back into the crock-pot if you used a regular blender and add now add the meaty part of the lobster tails to the soup, cover and cook 45 minutes on low or until the shells turn red and the lobster meat is cooked. Remove lobster tails from the soup and let cool slightly. While the lobster is cooling add the cream to the soup and stir. With a sharp knife cut each lobster tail in half long-ways and remove the lobster flesh from the shells. Discard shells and roughly chop lobster meat then add the meat back into the soup. No shallots? You can substitute an onion. I made your crockpot lobster bisque today; I used onion instead of shallots, and fat-free half & half from WalMart instead of heavy cream. It was really delicious. I did add some corn starch as my husband likes it thicker. Wow, a keeper for certain.